Several Loyola University New Orleans College of Law students, alumni and faculty were honored at the 2011 Loyola College of Law Moot Court Banquet on April 14 at the New Orleans Board of Trade. The Honorable Paul A. Bonin, J.D. ’76, was this year’s recipient of the Gisevius Distinguished Alumni Contributor Award. 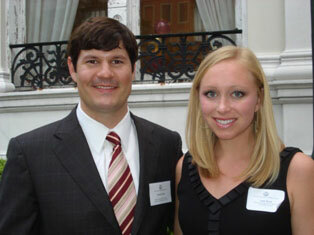 He was presented the award by 2010-11 Moot Court Board Chair Lauren Favret. College of Law professor Craig Senn was selected as the Distinguished Faculty Contributor. The Loyola Moot Court Program endeavors to cultivate the art of appellate advocacy with responsiveness and enthusiasm through team advancement, academic support and community involvement, thereby enhancing national recognition and pride among its members. For more information, contact James Shields in the Office of Public Affairs at 861-5888 or jshields@loyno.edu.